Beat the Parents Ask Me Anything is the friendly competition that brings families together. It's like a trivia game where every category is YOU! Kids ask a personality question of the their parents, then lock in their guess as to what they think the parents' answer will be. Parents then must guess which answer the kids expected them to pick. If they're right, they win the round. The parents then take a turn asking a question of their kids. What's your favorite thing about summer? What insect scares you the most? Everyone learns something new about each other while having a hilarious time! 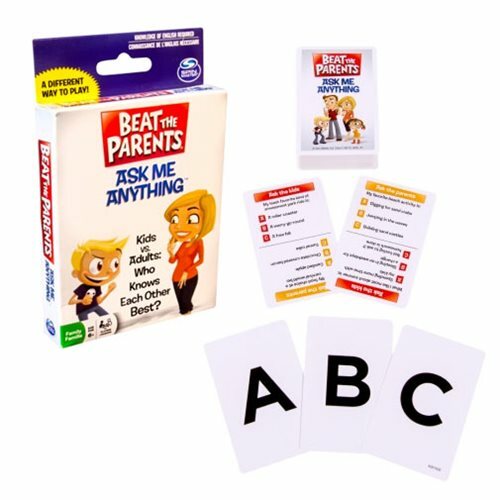 The Beat The Parents Card Game will be a great addition to the next family game night. For 2 or more players. Ages 6 and up.